You're invited to a Literary Celebration, where books are the main event! Bring your books along for a swap & exchange session. Children will enjoy our storytelling session with Teoh Choon Ean, author of three brand new children's picture books. This event is open to the public and children are welcome. Admission is free. Come by our Mutley Roadshow for some rollin' good times! We will have a dog adoption booth, educational booth, merchandise for sale, K9 Good Citizen session and more! Our adoption Starter kit includes 1 pipette of Frontline Combo Spot On Dog sponsored by Rhone Ma. We are also having a Seniors Package adoption, ask us about it! With just 2 more day to go, a lot of activities are going on at LASS. We still accept registrations. Sponsors: Glaxo Smithkline, Suntory Beverages,Permanis and many more. These extremely loving and playful kids are all below 2 years old, have been fully vaccinated and neutered. 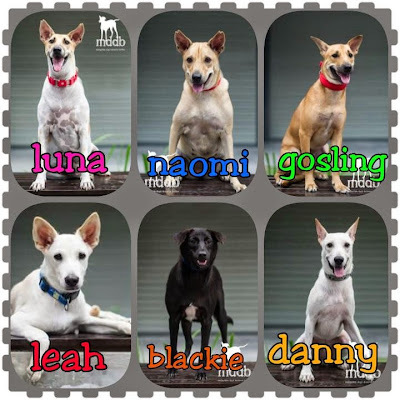 They will all be at our adoption drive this Sunday hoping to find their furever homes. Please give them a chance as they too deserve a place to call home. In return you will be showered with abundance of unconditional love.